Mixing with delay can add a depth to you mix in an interesting way. Short delays can be used to add distance between your instruments similarly to reverb. But unlike reverb you can add multiple repeats to the delay or echo, add interesting stereo panning and much more. There is quite a lot that can be done with delays to add unique sonic textures to your mix. Probably more than we can fit into one YouTube video, but here are 5 tricks to get you started! Add side chain compression to your delay. – This is like our reverb trick from last week. You simply add a compressor to your delay that is connected to the vocal via a side chain. When the vocalist sings, the compressor pushes the delayed signal down keeping your vocalist intelligible. When the vocalist stops, the compressor lets up and the delay tails come through and swell into your mix. It’s a wonderful sounding, simple effect! Distort a slap delay – Here is another simple trick that is easy to setup but can add some energy to you mix. 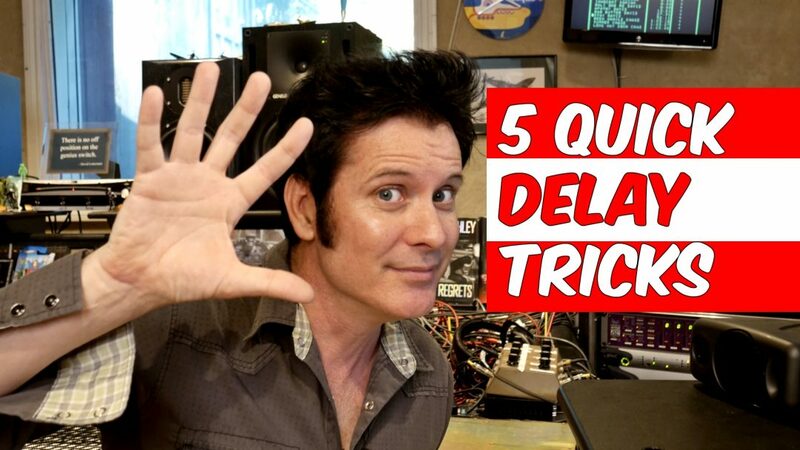 Use a simple slapback delay, but don’t go overboard unless you want to sound like Elvis. Then add some distortion to the delayed signal. Do a little or a lot and it will add a new level of excitement to your vocal. Add filter delay to your drums – This is trick is great for adding and interesting rhythmic undertone to a simple drum groove. Add a stereo delay to your drums. Next add high and low cut filters to the delay’s repeats. Last blend this in subtly under your drum track. Use a ping pong delay – Just like the previous example but add different subdivisions for the stereo delay on the right and left channels. In the video example, I use this on a piano with an 1/8 note on the left and a 1/16th note on the right. Just like the drums, I blend the piano delay back in underneath the main piano track and viola! Instant tasty piano sounds! Add a reverb after your delay – This trick is super simple to set up and can create and amazing washy sound. The reverb will add ambience only to the delays repeats. You can even get crazy with this and add any of the tricks above to the delay, then add the reverb after! Check out the video below to see me demonstrate all of these tricks. If you have any comments or questions be sure to leave them below! Have a marvellous time recording and mixing!